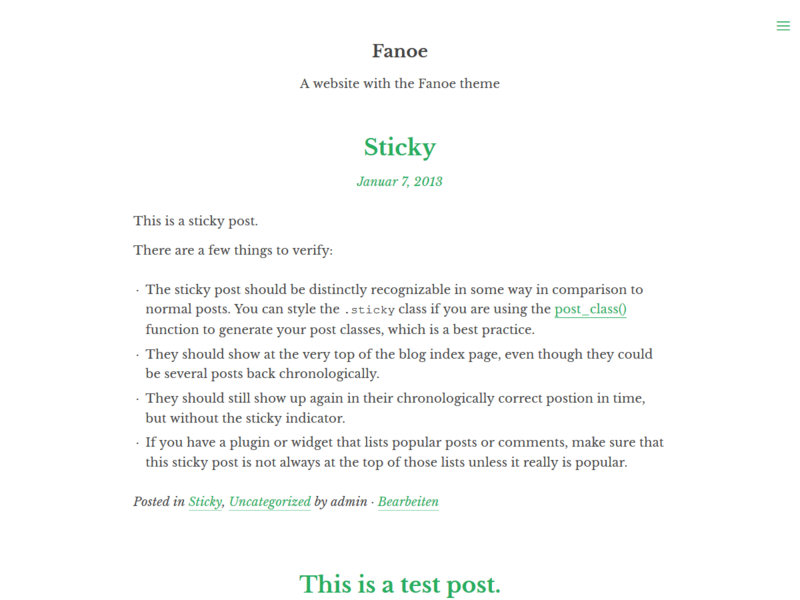 Fanoe is a responsive WordPress theme with an off-canvas sidebar. You can change the main design color in the customizer. Fanoe is responsive and so well prepared for small and large displays. It uses an icon font for the social media icons, so they are also sharp on high-resolution displays. Fanoe uses the customizer so you can adjust the copyright text, the main color of the design, show/hide the social media share buttons and the author description. Under Design › Widgets you can add a widget with links to your social media accounts. The links are displayed as icons. Fanoe is translation ready and currently available in English, German, France and Dutch. If you want to translate it to another language, you can translate it on translate.wordpress.org.